Stanley Kubrick’s intimate World War I film ranks amongst the best war films of all time. Dissimilar to most in the genre, this is less worried about epic battle scenes (although there is one continuous shot of soldiers advancing into battle which is mesmerizing) and more about personal relations of people and consequences of certain of their actions, even if the result of those actions is not necessarily their fault or intention. Kirk Douglas, working with Kubrick three years prior to their legendary collaboration with Spartacus, is astonishing as a man who does everything he can to stop the execution of three soldiers who are unfairly prosecuted for retreating from battle. There is a clear sense that Kubrick and Douglas were on the same level when making this film, the camera, guided by Kubrick, just seems to work completely in tandem with Douglas. As much of a master that Kubrick was this is as much Douglas’ film as it is his, with the performance of him taking the centre stage just as much as Kubrick’s directing expertise does. Whatever you may think of Mel Gibson as a person – you have to admit as a filmmaker he really knows how to get into the nitty-gritty of things. Even though I very much dislike his ludicrously over-praised Braveheart, I still can admit there was an honest brutality in his portrayal of the events that happened. 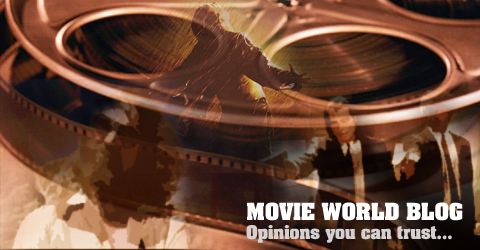 Same goes for The Passion of the Christ – the brash mentality of showing every suffering in full detail was a sight to behold, even if you don’t agree with it. Apocalypto was always going to be a hard film to accomplish but Gibson does it very well. He continues his brutal mentality, showing everything from human sacrifice to a jaguar tearing at the face of someone and many other shocking events that I am unable to safely describe. My second viewing of Wong Kar Wai’s first English language film proved to be worthwhile. Although it still wasn’t at the level I had heard from a few people, it still had improved from how bad I remember it being back when I saw it at the beginning of the year. The performances are the best aspect of the film; Norah Jones, in her first ever film role, is very watchable and the camera obviously loves her face. Jude Law is the weak link here, seemingly only in there for the ladies and to put on an abysmal Manchester accent; he’s charming, I guess you’d say, in that Jude Law kind of way but he’s basically the same as he is in most of his roles. However it’s in the supporting performances where the film truly shines; David Strathairn can do no wrong in my book and knocks the bitter, drunken mess role right out of the park here, Rachel Weisz, although a little over-the-top, is confident and convincing and Natalie Portman puts in a fun performance in the last half hour. Unfortunately the film has little else to commend it for. Oddly I’m a complete newcomer when it comes to the cinema of Joel and Ethan Coen. This is only the third film of theirs that I’ve seen, the other two being Oh Brother Where Art Thou? and the brilliant No Country for Old Men, which I loved from last year. After watching this and my opinion on No Country, I really must search for other DVD’s by them because, what I’ve seen so far have a uniqueness about them, originality; which is key to any successful film. Fargo is based around true events and set in 1987 in Minneapolis. Most of the characters are based around the actual people around those events but names have been changed. This immediately sets you thinking as a viewer about what exactly are you about to watch, This adds a touch of realism to the sequences that follow and you really start to believe each and every thing that happens. The characters in Fargo, feel like real people and not in any way manipulated by the writers to be something they’re not. You really feel that this sort of thing could happen to anyone at any given time. The main lead, played by the very underrated William H Macy, was doing something I’m sure any one of us could understand, given the recent economic problems in the US and the UK. You feel that what you are happening mirrors that of your own life in some respects…. Having seen the majority of a least most of Hitchcock’s films I felt I had to check out Rebecca, which I should have seen many years ago. Rebecca is as great as everyone says it is and should be considered a UK film and not USA, but at the time Hitchcock went to Hollywood and was given American funding for most of his work in the late 1940s, so perhaps this was to be expected. Still an awful shame considering the majority of the cast are English, as was the director, locations and bits and pieces of the script contains dialogue that is associated with English people. But that’s a small annoyance that I have. Rebecca was nominated for eleven Academy awards back in 1941, and won 2 of them. Three were for acting, which was well deserved. Laurence Olivier, with his English charm and gives out an instant attraction to the viewer that immediately makes you sympathise with the character of Maxim De Winter and feel what Fontaine’s character feels for him throughout the film. Both leads Oliver and Fontaine are just breathtaking to watch. You feel this instant affiliation with them both and want their marriage to work, despite the problems encountered in the first part of the film. Fontaine, who’s work I haven’t seen an awful lot of, has this innocent youthfulness in her, which Maximum does mention, which instantly makes you feel for her and in some ways, relate to. 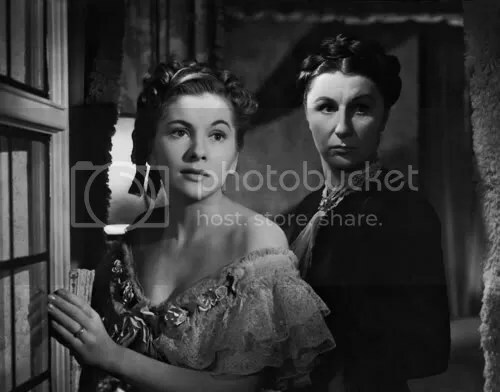 Great supporting role by Judith Anderson as the sinister Mrs Danvers, obsessed by the previous Mrs De Winter, delivers a marvellous performance which leaves you feeling scared, just like Fontaine’s character.